Many of my in-stock SAORI items are listed on my ETSY shop. However, if you’d like to talk to me about looms or other SAORI weaving equipment, please feel free to contact me by either email or by phone. 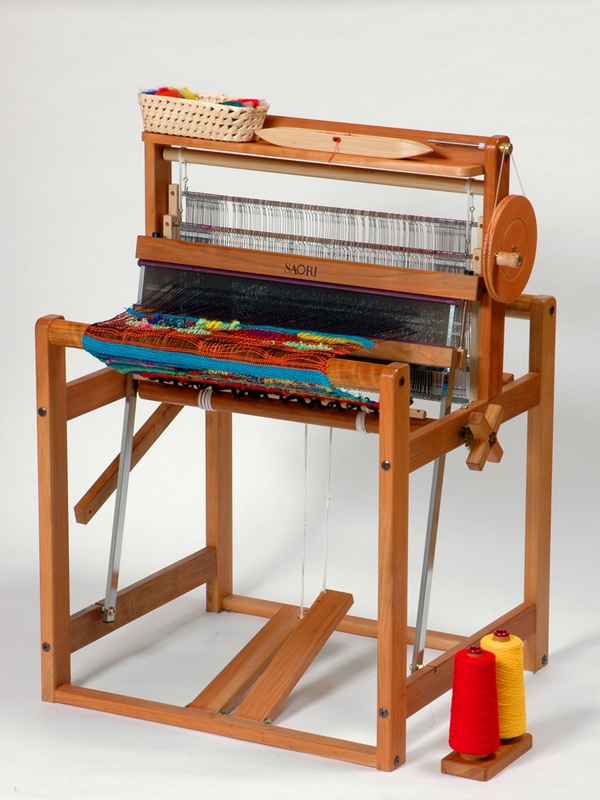 I’m happy to discuss the various looms and equipment that may be suitable for you. 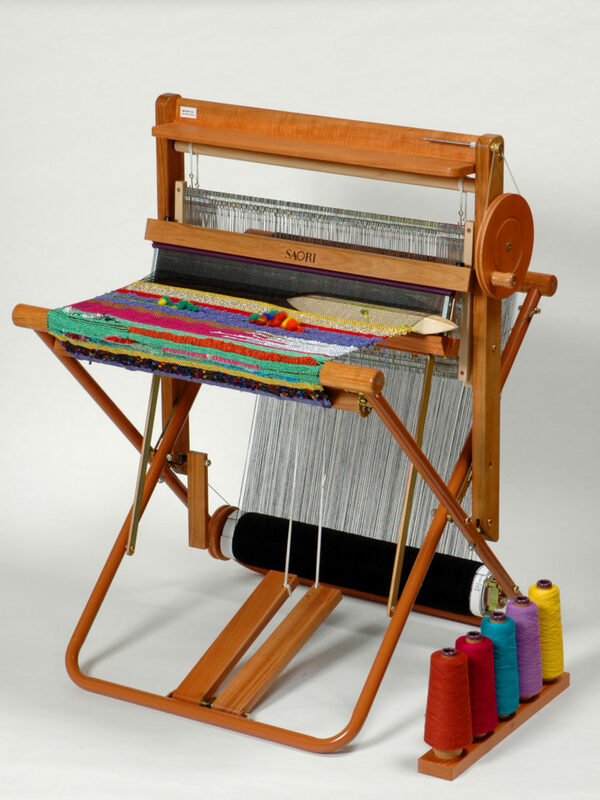 Whether it is the style of loom, the height of the loom best suited to you or other equipment and accessories you may be interested in, I’m here to help. 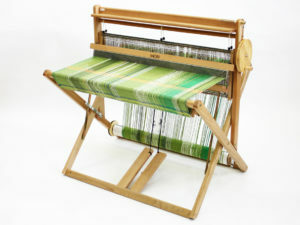 Once you purchase a loom, I’m also here for support by phone, Skype or email. 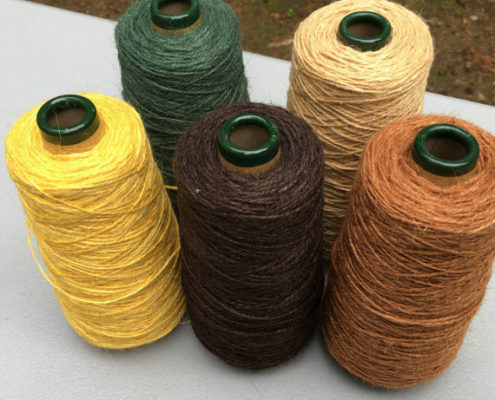 Listed below are the looms, their features and the 2018 pricing. I try to keep a good selection of the accessories, warps, yarns, books and other items offered by SAORI Japan. There is a website from the manufacturer (Sakaiseikisangyo Co. Ltd.) in Japan that has all of the items available. You can find it here . If there is anything here that you have questions about or would like me to order in for you, please let me know. You can always purchase a Gift Certificate that can be put towards classes, workshops or equipment. You can choose your amount. The SAORI looms are unique in many ways. One of the most notable features is the ability to change projects at any time – no need to finish one project before replacing one ‘inside set’ with another. 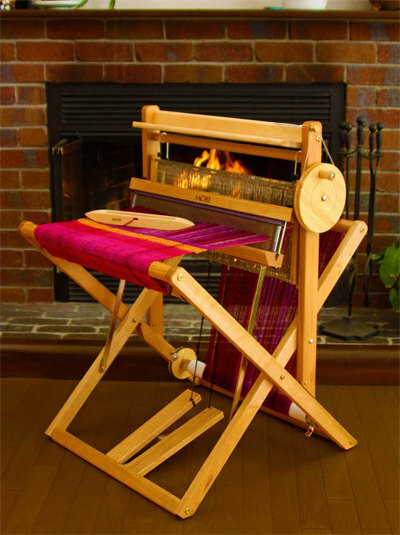 The SAORI WX60 Loom is made of beautiful wood and foldable for transport and storage. The WX90 is available only in a disassembled package and no pre-wound warp is included. The WX90 model is produced in a built-to-order system, and so it takes longer lead-time for production than other models. It has been taking about one month or more depending on the timing of the receipt of an order plus shipping time of 6-8 weeks. Expedited shipping can be arranged for an increased price. The SAORI SX60 folds for storage or transportation, yet is sturdy when in use. 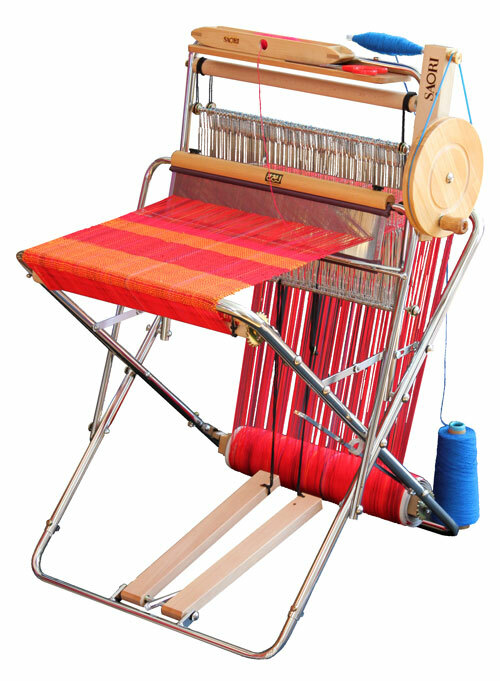 The built in bobbin winder and many other features of this unique loom make it a pleasure to weave with. High-quality cherry wood and tan metal frame. SX60H loom has a longer metal tubing, which makes the position of the breast beam 74cm (about 29 inches) away from the floor. This is 5cm (about 2 inches) higher than the SX60 loom. It gives the comfortable space for tall weavers. Moreover, the SX60H loom has a space and holes for another warp roller, with which you can enjoy double beam weaving more easily by purchasing an extra warp roller. The SAORI CH60’s elegant style makes it very popular. Durable body made of high-quality cherry wood. SAORI 60A-2 is wheelchair accessible and height-adjustable. It has all the features of the SAORI 60; however, the wooden pedal beam is replaced by a flat adjustable metal brace. 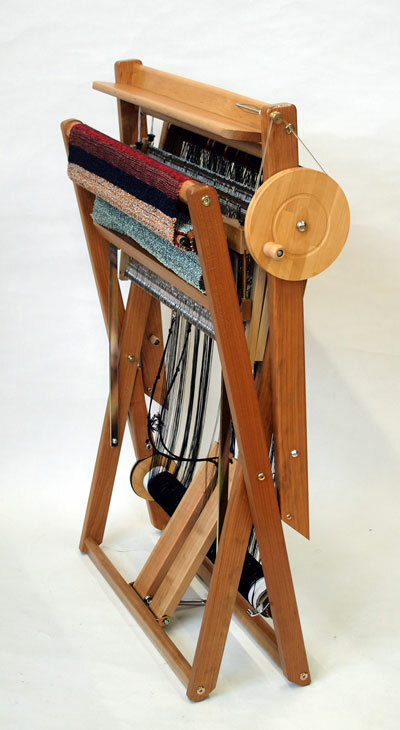 This lets a weaver in a wheelchair roll in close to the loom. The brace also has 5 height settings, allowing you to raise the loom up to 12.5cm (4.9″) from the floor. This is helpful to taller weavers as well! 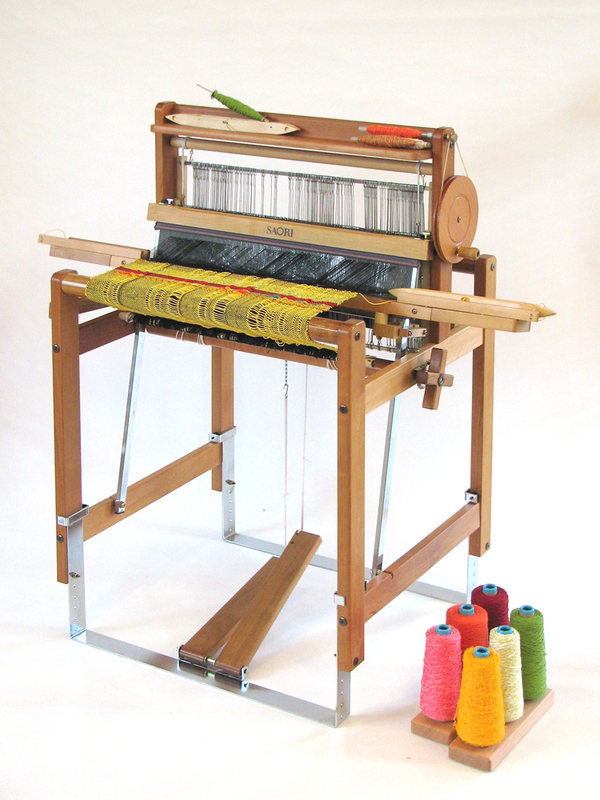 SAORI Piccolo 40 Loom – this metal frame loom is foldable and very portable. It adjusts to two heights – one is suitable for children as young as 3 years old, the higher setting is only one inch shorter than the SX-60 loom. Two heights for adults and children. *Please note: Prices do not include HST/PST/GST (where applicable). Many of the SAORI looms, SAORI weaving equipment and accessories are kept in stock, please inquire about availability. 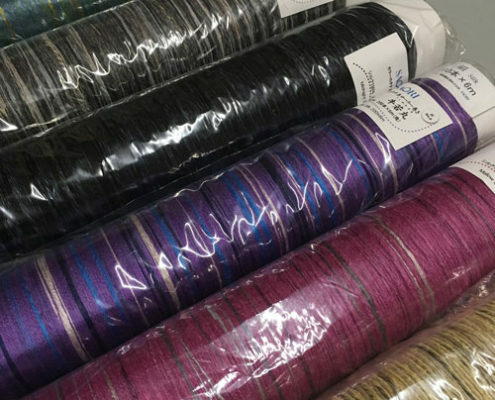 All prices for SAORI weaving looms, books, equipment and yarn are for pick-up on Salt Spring Island and are shipped from Japan by surface mail (6-8 weeks from time of order if not already in stock). Additional charges for expedited shipping methods. Shipping to your Canadian location can easily be arranged. Shipping charges are based on Expedited, Tracked and Fully insured shipping with Canada Post. Loom shipments are typically in the $80-$120 range depending on where you are in Canada and the model of loom that you choose. As per my agreement with SAORI Japan, I only sell SAORI products in Canada. If you are not in Canada, you can find the nearest SAORI studio to you on SAORI Global. If you do not see your country listed here, please contact Japan directly through the SAORI Looms site.